Today is the Feast of the Transfiguration of the Lord. I've been scrolling through various articles and images of the transfiguration. Still in grok mode so don't have a lot to say on it. 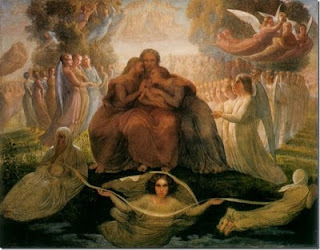 What I find curious is that both Moses and Elijah are standing next to the transfigured Christ. I don't know what this means but it seems important. Why are the apostles groveling? Are they really groveling or is something else going on? I am wondering what Moses and Elijah meant to those who wrote the scriptures. Was their understanding of these characters the same as ours? There's so much in Mythical, Christian and Hermetic imagery and vocabulary that has such intense meaning for those who brought them into the world as well as those who passed them on. I am looking at the image above and know there is something compelling there and yet I see just an aesthetic picture; something quaint from a bygone era. I know there's more, and that's what draws me to iconography, gnostic images and stories. This is what makes feast days challenging for me. Whatever that is in me that resonates when presented with these symbols, that's the insider. My answer for now is to continue reading, asking questions, praying. There's is not much else to do. I don't know a lot about this mystical lady from Norwich England. From what I've read on Wikipedia I find her fascinating. 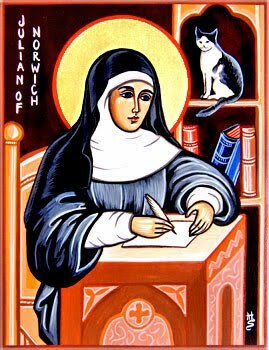 Her writings such as Revelations of Divine Love illuminate an aspect of divinity that is in stark contrast to the standard image popular among Christianity today and her time as well. This very well known quote is one of hers: "All shall be well, and all shall be well and all manner of thing shall be well." This to me speaks to the 'Okay-ness' of things in spite of troubles, frets, difficulties and even suffering. The last thing needed in relating to the divine is fearful constant trembling at a god that is secretly believed to be out to get us. A god that we somehow privately understand has rigged the game all along is one that is difficult to relate to or even want to relate to and take seriously. I think Julian not only presents us with a corrective to this wrathful god-image, but an alternative that can be counted on - at least until we come to our own understanding or gnosis. There are so many mind made hindrances that prevent us from trekking the spiritual path. To my mind, St. Julian dispels many of these and her work is the healing salve that allows our seeking nature to be at home and have a place to work from. Jesus said "Be a Passerby". This short saying can be quite puzzling and I continue to reflect on it often. At first one may think it's saying something like "Be apathetic". But a passerby is simply one who moves on unattached to each place. He is not necessarily unavailable to the places he visits, but he moves on like a river that may feed the crops or flood a valley and yet still continue on it's way back to it's source. Gnostics are often accused of being world denying and perhaps many were and are. 'World denying' in this sense is synonymous with 'life denying'. But many of the Gnostics I know today are not this way at all and I believe Thompson's views reflect a more life embracing view while also recognizing the importance of unmasking the fraudulent and unjust. I knelt here once and asked with outstretched hands, For things that don’t mean anything at all. So I will kneel and ask for nothing now. The things we want are worthless, and the worldDenies them to us to expose the fraud. I’ll praise the mercy of this savage God, Who forced me to approach Him as I am-A man with open eyes and empty hands. No matter what we create it won’t last forever. The so-called immortality of great art is just a slightly longer moment in a vast span of time, which will disappear as if it never existed just as we do. But beauty is its own end; it requires no prop. No one asks the Cathedral of Chartres if it ought to have been built; its magnificence is its justification. We shouldn't cultivate the spirit merely in order to chase the chimera of happiness, and we shouldn't be so naive as to think that we can be free of pain. We should cultivate our spirits for no other reason than to make them beautiful, to create in our own selves the harmonious balance of which we’re capable. This beauty includes every aspect of a life well-lived- from struggle and ambition to love and service, treating others with respect and equality while not being afraid to fight for what’s right, accepting the hard facts of a hard world while retaining the capacity for joy and ecstatic awe. If we find happiness along the way, then so be it, and if we find suffering instead then so be it. Either way, we’ll become something more than we were, whatever our talents or lack of them. We’ll be able to say we actually lived. In a world where so many people only pass the time, marking the minutes in Thoreau’s “quiet desperation” until it is time to die, that is reason enough. 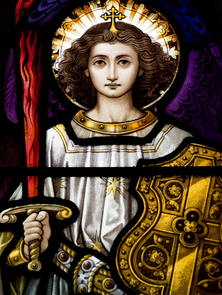 O glorious prince of the heavenly army, Saint Michael the Archangel, defend us in the eternal combat, which we sustain against the powers of darkness, malice and ignorance, which afflict us on this aeonial battlefield of our earthly life! Come, invincible leader of the host of heaven, guardian of the paradise of the world and wielder of the double-edged, flaming sword! Aid and sustain us in our defense against the adversary; and come to lead us finally into the presence of the Most High, into the abode of the blissful. Enlighten and purify us, O Thou great and mighty Archangel Michael, grant us to abandon the works of darkness and to love the Gnosis of the Light; so that whilst all things of this world pass away we may ever hold fast those things which abide for evermore. Jesus said, "If they say to you, 'Where did you come from? ', say to them, 'We came from the light, the place where the light came into being on its own accord and established itself and became manifest through their image.' If they say to you, 'Is it you? ', say, 'We are its children, we are the elect of the living father.' If they ask you, 'What is the sign of your father in you? ', say to them, 'It is a movement and a rest.'" 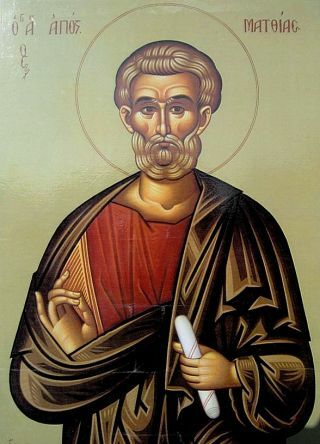 Today is the feast day of Holy Apostle Matthias. I've never heard of him before today and in line with my endeavour to read about the saints as their feast days approach, I tried to find more about him on the web. There seems to be very little written about him. He was born in Bethlehem and is of the tribe of Judah. He was a student of Simeon. He replaced Judas Iscariot as the twelfth apostle. I did not find much more other than he may have authored some Gnostic Gospels (or more likely had a Gospel named after him). The Gospel of Matthias no longer exists but has shown up referenced in the writings of several prominent early Christians from Origen to Jerome. Like many of the saints from this time period, he was also a martyr according to some accounts. Lately, I've been looking for which of the many many gospels resonate for me. I was fortunate the other night when I happened on the Gospel of Truth believed to have been written by Valentinus. It is a day in which it is not fitting that salvation be idle, so that you may speak of that heavenly day which has no night and of the sun which does not set because it is perfect. Say then in your heart that you are this perfect day and that in you the light which does not fail dwells. If I could keep what this does to me with me throughout the day, what would happen? How does this translate? Make sure-footed those who stumble and stretch forth your hands to the sick. Nourish the hungry and set at ease those who are troubled. For you are this understanding which encourages. If the strong follow this course, they are even stronger. Turn your attention to yourselves. Do not be concerned with other things, namely, that which you have cast forth from yourselves, that which you have dismissed. Do not return to them to eat them. Do not be worm-eaten, for you have already shaken it off. Do not be a place of the devil, for you have already destroyed him. Do not strengthen your last obstacles, because that is reprehensible. For the lawless one is nothing. He harms himself more than the law. For that one does his works because he is a lawless person. But this one, because he is a righteous person, does his works among others. Do the will of the Father, then, for you are from him. These to me seem to come more out of a mode of being then merely being laws to observe. They're words of advice from a place of knowing.